Multiple cropping is a form of Ecological Intensification that is potentially highly sustainable when two or more crops are grown at the same time or in a sequence. It does this by balancing three key ecological processes: competition, on the one hand, and commensalism (one plant gaining benefits from the other) or mutualism (both plants benefitting each other) on the other. Typically, farmers will plant crops as close together as possible to utilise all the available land. 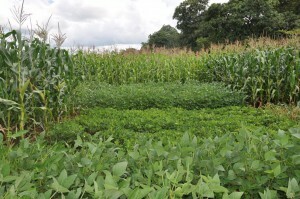 When different crop species or varieties are grown together, the competition may be fierce; ‎trees grown in a maize field, for example, may shade out the crop. But this can be compensated for by determining the optimal spacing and by exploiting various forms of commensalism or mutualism, for example where the tree may be a legume, providing nitrogen for the crop plant beneath. Intercropping: interspersion of different crops on the same piece of land, such as a home garden, either at random or more commonly in alternate rows usually designed to minimise competition but maximise the potential for both crops to make use of the available nutrients, such as nitrogen supplied by a legume. Rotations: the growing of two or more crops in sequence on the same piece of land. Agroforestry: annual herbaceous crops are grown interspersed with perennial trees or shrubs. The deeper-rooted trees can often exploit water and nutrients otherwise unavailable to the crops. The trees may also provide shade and mulch, creating a microenvironment, whilst the ground cover of crops reduces weeds and prevents erosion. Sylvo-pasture: similar to agroforestry, but combines trees with grassland and other fodder species for livestock grazing. The mixture of shrubs, grass and crops often supports mixed livestock populations. Green manuring: the growing of legumes and other plants to fix nitrogen and then incorporate the nutrients into the soil for the following crop. Commonly used green manures are Sesbania and the fern Azolla, which contains nitrogen-fixing, blue-green algae in ricefields. Multiple cropping is highly sustainable as it relies on reducing competition and increasing mutual benefits between crops. It can provide a more efficient use of resources, such as soil nutrients, that would not otherwise be available to a single crop; support or shade a companion crop; or host a great diversity of insects, bacteria and other organisms that contribute to pest and disease control. Nitrogen is essential for plant growth but it is often lost from the soil through unsustainable agricultural and soil management practices. Multiple cropping with nitrogen-fixing legumes can improve soil quality by replenishing the soil with N. Increased N in the soil decreases the reliance on both organic and inorganic fertilisers, reducing the amount of money and labour farmers need to spend on inputs. At the same time, the natural capital of the soil is conserved. Increasing the availability of N in the soil is associated with improved crop growth, which can in turn improve the livelihood of the farmer. Further, incorporating nutrient dense crops such as legumes into the rotation can increase farming households access to nutritious foods, improving their nutrition security. Multiple cropping of compatible crops can encourage biodiversity, by providing a habitat for a variety of insects and soil organisms that would not be thrive in a mono-crop environment. In turn, this may limit the number of outbreaks of pests by increasing the number and diversity of natural predator biodiversity. Additionally, reducing the homogeneity of the crop increases the barriers against biological dispersal of pest organisms as the pests may not be attracted to all crops within the system. However, certain insects, pests and diseases may spread easily from one crop to the next through crop residues. Growing a diverse variety of crops through multiple cropping is also thought to be critical to nutrition particularly where households grow the majority of the food they eat. Micronutrient deficiencies, a sub-set of under nutrition, occur when the body lacks one or more micronutrients (such as iron, iodine, zinc, vitamin A or folate). It is estimated that more than 2 billion people, especially children, lack sufficient micronutrients. Growing highly nutritious and diverse crops, such as legumes, can increase the amount of nutrients a household receives. Multiple cropping with crops that are biofortified with micronutrients such as Vitamin A orange fleshed sweet potato can add further nutritive value per hectare. Multiple cropping acts as an insurance against failure of crops in abnormal weather conditions.The risk of total crop failure due to uncertain monsoon is reduced if two crops of a different nature are grown simultaneously as a mixed crop. Further, crops of a particular species are more prone to a particular type of pest (weed, insects, or diseases) infestation. 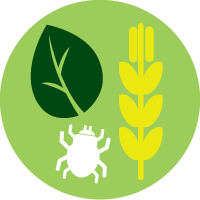 When different types of crops are grown together the chances of pest infestations are reduced or diluted. This further reduces the chances of total crop failure for farmers. Care must be taken to plan the timing, spacing‎ and mixture of crops so that the balance between competition and commensalism or mutualism is enhanced. Examples of planting strategies include combining a deep-rooted crop with a shallow-rooted crop, or planting a tall crop with a shorter crop that requires partial shade. Managing rotations requires more skill than managing a single crop and harvesting may be more complicated than for mono-crop systems. Successfully implementing multiple cropping may therefore require training and education that can be difficult for smallholder farmers to receive. Farmers may be reluctant to try out new crops that they are not used to growing or eating, or for which no defined market exists. Multiple cropping with cash crops can be highly profitable offering additional income from the sale of additional crops. However, when diversifying the crops grown on a farm, it is vital to ensure that there is either market demand or household demand for the new crops introduced. Local people may be identified and trained as extension workers to change the attitudes of farmers. Vandermeer, JH 1989, The Ecology of Intecropping, Cambridge University Press, Cambridge. Nnadi LA & Haque, I 1985, ‘Forage legume-cereal systems: improvement of soil fertility and agricultural production with special reference to sub-Saharan Africa’ in Africa small ruminant research and development processing’s of a conferenceheld at Bamenda, Cameroon, 18-25 January 1985. Eds I Haque, S Jutzi & PJH Neate, ILCA, Addis Ababa. Available from: <http://www.fao.org/wairdocs/ilri/x5488e/x5488e00.htm#Contents> [25 June 2015]. Altieri, MA & Nicholls, CI 2004, Biodiversity and Pest Management in Agroecosystems, Second Edition, Food Products Press, An Imprint of The Haworth Press, Inc., New York, London and Oxford. Food and Agriculture Organization of the United Nations (FAO) 2015, ‘Crops and cropping systems’ Ch. 6 in Conservation Agriculture: A Manual for Farmers and Extension Workers in Africa, FAO, Rome, Available from: <http://www.fao.org/ag/ca/AfricaTrainingManual.html> [25 June 2015]. 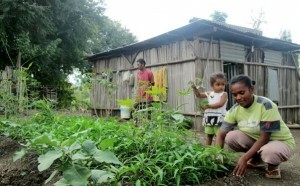 Home gardens are traditional intercropping systems that provide subsistence, opportunities to commercialise products, and serve multiple environmental and social functions by combining agricultural crops with ‎tree crops and livestock. Home gardens are typically characterised by a great diversity of useful plants and livestock in a small area, cultivated in intricate relationships with one another. On the island of Java, Indonesia, home gardens called pekarangan are particularly well developed. The most extensive areas of home gardens in Java and the most intensive cultivation occur below an altitude of 800m where the dry season is short or absent. Usually taking up little more than half a hectare around the farmer’s house, home gardens contain a huge variety of plants for food, medicine, condiments and spices, and feed for livestock and fish stock. Much of what is produced is for household consumption, whilst some is sold at local markets. Although most common across southern and Southeast Asia, successful home garden training programmes have been instituted in Niger, Somalia, Ghana and Kenya under the leadership of the Food and Agriculture Organisation’s (FAO) Nutrition and Consumer Protection Division alongside supportive networks of national extension, research and training institutes and NGOs. The home garden may be capable of producing a large and varied harvest, contributing to food and nutrition security, but the returns are often small and typically insufficient to bring people out of poverty as a stand-alone method. In this case, however, promotional forums, campaigns, recipe booklets and cooking demonstrations teaching the nutritional value and varied uses for these vegetables changed seasonal planting methods to demand-driven and time-scheduled production to meet increased market demand. Farmers also received business support, reliable access to improved quality seed, and linkages to both formal and informal markets. The demand for AIVs grew by 135% over the 2-year project in Kenya and an estimated 9,000 tonnes of vegetables were sold delivering earnings of Ksh80 million (US$800,000) from informal markets and Ksh150 million (US $1.5 million) in formal markets. Soemarwoto, O & Soemarwoto, I 1979, The Village Home Garden. A Traditional integrated System of managed Plants-Animals. International Conference on Human Environment: Methods and Strategies for Integrated Development, Arlon. Terra, GJA 1958, ‘Farm systems in Southeast Asia’ Nethlands Journal of Agricultural Science vol. 6 pp. 157-182. Soermarwoto, O & Conway, G 1991, ‘The Javanese home garden’ Journal for Farming Systems, Research and Extension vol. 2, pp. 95-117. The shrub Tephrosia vogelii can grow very quickly, up to 4 metres high, fixes nitrogen and can be used as green manure. In Maraba, Southwest Rwanda, coffee productivity is constrained by poor soil fertility and lack of organic mulch. A 2-year study on 8 smallholder coffee farms trialled the effect of intercropping Tephrosia and coffee. 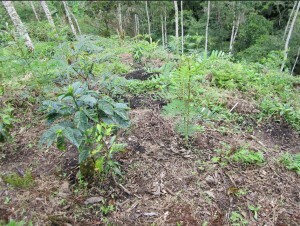 The mulch produced from Tephrosia was also used on the coffee plots. In the first year, Tephrosia intercropped with coffee produced 1.4–1.9 tonnes per hectare of biomass and added 42kg–57kg of Nitrogen per hectare. This treatment increased coffee yields by 400kg–500kg per hectare, compared to traditional management methods. In the second year, Tephrosia produced between 2.5–3.8 tonnes per hectare of biomass and added 103kg-150kg of Nitrogen per hectare. This increased yields of coffee by 400kg per hectare. Over the 2-year study, coffee yields increased between 23% and 36%. Tephrosia mulch was 87% as efficient as inorganic fertiliser used under similar conditions, and represented a saving of 30 days of labour hours per hectare compared to current farmer management through reduced labour required for weeding. Together the labour savings and the improved yields translated into the farmers producing 5kg of coffee per labour-day, compared to 3.4kg per labour-day under traditional management. World Agroforestry Centre 2015, Agroforestree Database Available from: <http://www.worldagroforestry.org/resources/databases/agroforestree> [25 June 2015]. Bucagu, C, Vanlauwe, B, Giller, KE 2013, ‘Managing Tephrosia mulch and fertilizer to enhance coffee productivity on smallholder farms in the Eastern African Highlands’, European Journal of Agronomy, vol. 48, pp. 19-29. Farmers in Western Kenya traditionally row-crop maize with nitrogen-fixing legumes to increase yields and soil fertility. Nitrogen is returned to the soil from the falling leaves and decomposing roots of the bean plants. Researchers at the Sustainable Agriculture Centre for Research, Extension and Development in Africa (SACRED-Africa), noticed that the single rows were not providing enough light for the legumes, and that the second maize crop often failed due to insufficient late rains. To address these constraints, they pioneered a new system known as MBILI (Managing Beneficial Interactions in Legume Intercrops), meaning “two” in Swahili. MBILI consists of intercropping double rows of maize and legumes, allowing for better light and soil conditions, whilst maintaining the same plant populations. 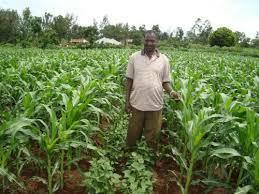 The system yields nearly 3 tonnes of maize and more than 500kg of legumes per hectare. MBILI has been shown to increase production by 26% – 37% in the short rain season and around 7% in the long rain season. The greatest improvement is noted in groundnut which can increase by 101% compared to conventional conditions. Farmers earn an average of 31,689 KSh (US$325) per hectare using MBILI intercropping, compared to 26,333 KSh (US$270) with conventional methods. Woomer, P, Lan’gat, M & Tungani, JO 2004, ‘Innovative maize-legume intercropping results in above- and below-ground competitive advantages for understorey legumes’ West African Journal of Applied Ecology vol. 6, pp. 85-94.